Map of the United States of North America: with parts of the adjacent countries / by David H. Burr (late topographer to the Post Office), geographer to the House of Representatives of the U.S.
Map of the United States Of North America. 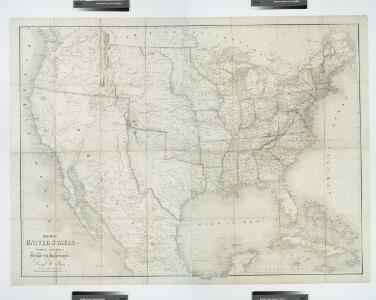 1 : 4435200 Rosa, R.
American Union Railroad Map Of The United States. Pictorial Map Of The United States. Verein-Staaten Von Nord-America, Mexico, Yucatan U. A. 1 : 13400000 Stulpnagel, F.v. Map of the United States of America with its territories &amp; districts : including also a part of upper &amp; lower Canada and Mexico. The American Republic and rail-road map of the United States. 1 : 5000000 Freyhold, Edward United States. War Dept. United States of America, 1900. The course of the River St. Laurence : from Lake Ontario, to Manicouagan Point ; United States of America. Verso: American Airlines system map. 1 : 6336000 American Airlines, inc.
United States of America. Pergamon World Atlas.